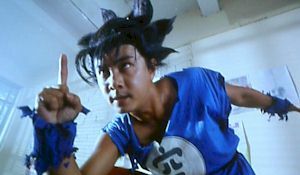 A list of each actor and the "Street Fighter" character they slay...er, play. The Skinny: Calling this film bad would be an insult to actual bad movies. Further proof that the concept behind the "Street Fighter" video game will never make a good movie. Also further proof that Wong Jing should be incarcerated. 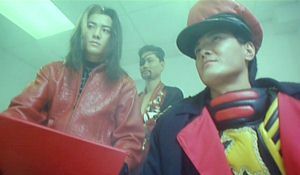 If the Surgeon General ever felt like outlawing films for their harmful side-effects, then he should start with Wong Jing's Future Cops. This shameless rip-off of the "Street Fighter" video game is so egregiously bad that it could cause untold scarring to those not forewarned. It's understandable that audiences may want to give this flick a try. After all, it's based on a world famous video game and has more Hong Kong megastars than an issue of East Weekly. Still, despite that - or maybe even because of it - Future Cops seems destined for the Cinema Hall of Shame. For the record, here's the plot: the Future Cops (Andy Lau, Jacky Cheung, Simon Yam and Aaron Kwok) are hot on the tail of the evil bad guys, who are intent on freeing their boss Ken Lo Wai-Kwong. However, said bad guys (led by Ekin Cheng and Billy Chow) hightail it into the past. Their goal: to brainwash future judge Yu Tin-Hung, who will one day sentence their boss. They figure to get to the guy while he's in high school, but can't figure out who he is. The Future Cops decide to chase them, but run into the same problem. If they can't find Yu Tin-Hung, how can they help him? So here's the solution: they go undercover. Jacky Cheung disguises himself as a high school teacher, hits on student Winnie Lau Siu-Wai, and breaks into song in the middle of class. 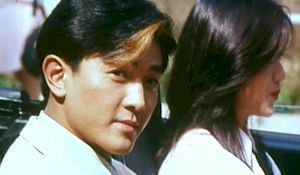 Andy Lau pretends to be a student, meaning lots of humor ripped off from Fight Back to School, as well as a romance with Chingmy Yau, who's also supposed to be a high school student. 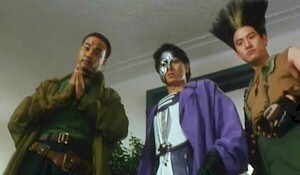 And Simon Yam pretends to be Dicky Cheung's servant to help Cheung fight off the evil bullies who torture the girly-man. 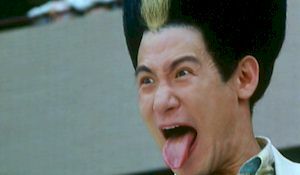 They also act silly, engage in extremely random and mostly unfunny comedy, and generally make life hell for the legions of paying consumers who would salivate at the chance to see Andy Lau, Jacky Cheung, Aaron Kwok, Ekin Cheng, Chingmy Yau, Charlie Young and many more superstars in one single film. Those people got their chance with this film. And, as they may have discovered already, the chance was a wasted one. Dead flies have more going for them than the stinking carcass that is Future Cops. Sure, there's some amusing action in the beginning (courtesy of Ching Siu-Tung), but the novelty wears off pretty damn soon. After that, there's an action embargo for the next hour as the school shtick and puerile situation comedy rule the screen. Cutting your toenails with a dull x-acto knife would be a hell of a lot more exciting than this "comedy." Think about it this way: somebody actually said, "Hey, let's make a 'Street Fighter' movie! We'll cast big stars! And they'll all go undercover in high school and harass the students!" Whose bizarre fever dream was this? images courtesy of Universe Laser & Video Co., Ltd.